This book is a quick and easy refererence on the concepts of accountability-based management. You can use it to learn about and apply the principles in your workplace or to refresh your memory if things seem to be going off the rails. Anyone in a business organization who is interested in building a trust-enhancing workplace where people have fulfilling work, are treated fairly, and can count on their manager to add value. Ginty Burns is a partner in COREinternational inc, a management consulting company that designs accountability-based management systems and provides support with implementation. Born and raised in England, she is an editor and technical writer with a keen interest in communicating ideas through clear, jargon-free documentation. She now lives in Toronto, where she has written or co-written a number of articles on accountability-based management. You may have heard about the organization that employed people named Everybody, Somebody, Anybody and Nobody. There was an important job to do and Everybody was sure that Somebody would do it. Anybody could have done it, but Nobody did. Somebody got angry about that because it was Everybody’s job. Everybody thought Anybody could do it but Nobody realized that Everybody would not do it. It ended up that Everybody blamed Somebody when Nobody did what Anybody could have done. This book is not about that organization. Instead, it’s about building or working in an organization where Everybody can succeed because Everybody has clear accountabilities, a manager who adds value, and the resources to do the job — an accountability-based organization. 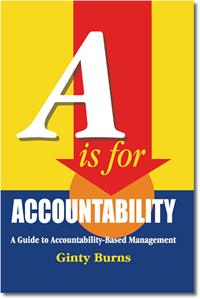 Find out more about the book, read excerpts from “A is for Accountability”.